When working from home, having a dedicated office space is awesome, and having one that serves more than just a single purpose is even better. 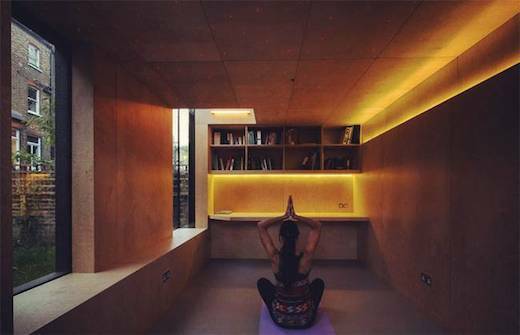 The firm Neil Dusheiko Architects from London, UK, recently built this sustainable garden office, which also doubles as a yoga studio and even a playroom for children. This space is used by a psychiatrist who practices from home, and they use it to see patients during the day. The structure is called the Shadow Shed, and they chose this name because it was envisioned as a space with a dark skin, but with light and warmth at its center. I think they did a good job of bringing this image to life. The office shed is located at the far end of the garden and was sunken slightly into the ground. 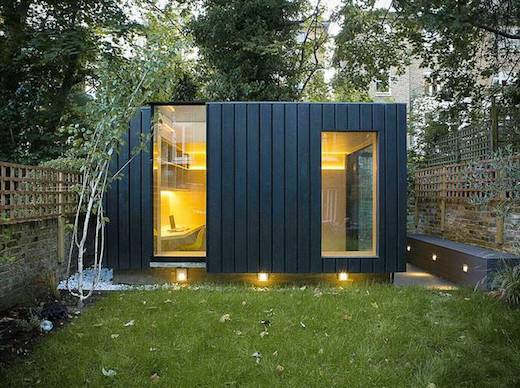 It is clad with heat-blackened cedar, also known as the shou sugi ban technique which is a popular all-natural way of protecting wood from fire, pests and rot. The main aim in the design of this structure was to make it blend into the surroundings as much as possible, and I think they pretty much succeeded. 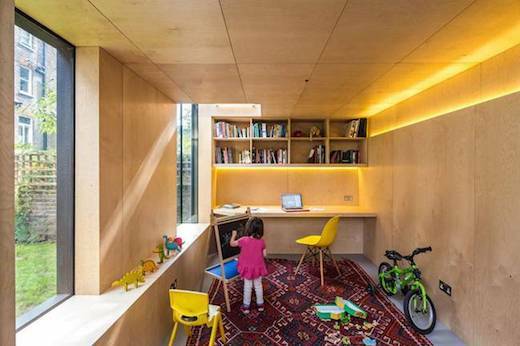 The interior is comprised of just a single room, which was clad using recycled birch plywood. The furniture was also made using this same material, which gives the interior a clean, seamless look. 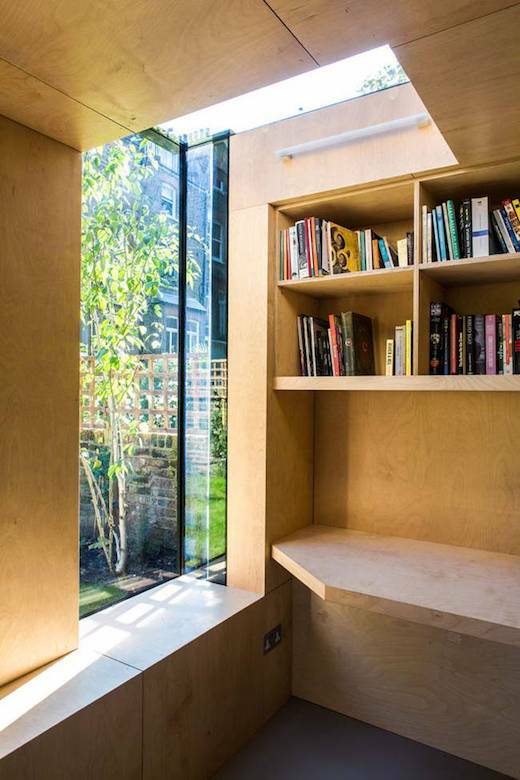 The shed has two large windows on the side, as well as a skylight, which togetehr let in plenty of natural light. LEDs in the form strips and tubes, as well as multi-colored, pinpoint bulbs placed into the ceiling, are used to illuminate the interior after it gets dark outside. 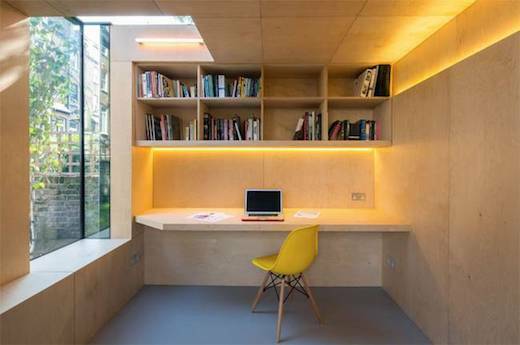 Due to it’s dark façade, the office shed is virtually invisible at night, save for the light spilling out of it’s oversized windows. 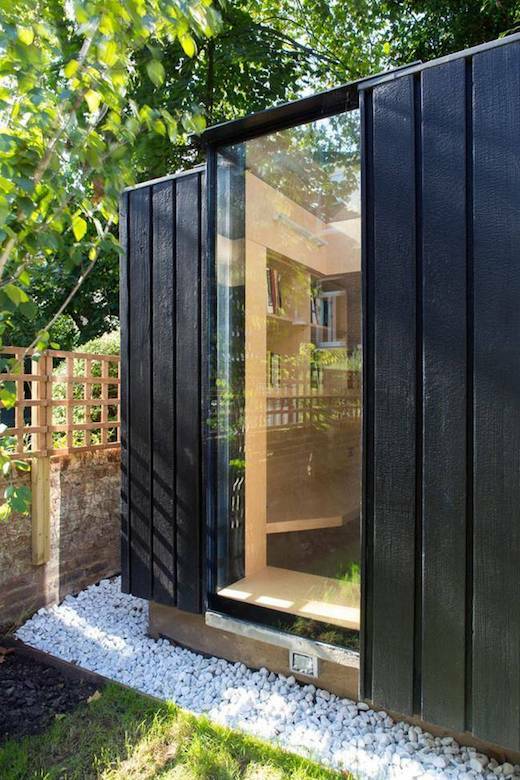 This cleverly designed garden shed is definitely one of the nicer ones we’ve seen. The fact that it was also built using sustainable methods and techniques is also commendable.